Treadmills are one of the largest purchases you might make for your home gym, with in size and with how it affects your pocket. Getting the right one with the right features is really important. Today I’m doing a JLL s400 treadmill review – one of the most popular treadmills around right now. I hope you find it helpful and informative! This JLL s400 premium motorised folding treadmill is a mid range model that does pretty much everything you want a treadmill to do. It is a strong and sturdy machine that is a good size for having in the home – not too small that it’s not up to the job though. I’m a big fan of the JLL exercise machines and this one is no exception – I think they are excellent value and perfect for a home gym or exercise room. This treadmill folds away which I think is a really good feature, especially on these bigger models. They are so big that they can take up your entire space in your gym area so being able to fold and place to one side (quite easy – there are wheels to help roll it away) is a bonus in my books. 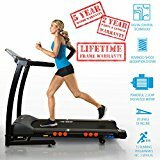 The speed of this treadmill goes from a very leisurely 0.3 km/h all the way up to 16km/h so is good for walking or jogging plus a variety of warm up and cool downs as well no matter what your normal pace is. My pace for walking is really fast, but my wife walks much slower at her ‘resting’ pace so she definitely needs lots of different variations. This has increments of 0.1 km/h. The machine also has a range of incline levels from zero all the way to twenty. This means that you can simulate the effect of running up hills, steep mountains or just a flat course. The maximum setting equates to about a 12% incline. There are also 15 programmes available which includes a heart rate programme. Basically you tell the machine what you want to keep your heart rate at and it will adjust the speed or incline based on this. You can also programme the first three by yourself so there’s plenty of room for customisation and to keep you interested in it all. One thing I like about this is that there’s an inbuilt entertainment system so you can always have some music playing while running. It connects to your phone or iPod via Bluetooth or alternatively with a usb port. I like the Bluetooth setting as it means I don’t run the risk of knocking my phone off. There are inbuilt speakers that I find are adequate enough for the needs of someone in a gym – I’m sure they aren’t great if you asked someone who knows more about sound quality! But they are certainly good for the purpose. If you’re looking to save a little it of money then you might be tempted to go with the lower model – the JLL s300. This is still a great treadmill and comes highly recommended. The differences between the two are simply that the S400 has a much bigger running area in both width and length – 135 cm x 45 cm compared to the S300 which is 122cm x 40cm. The S300 allows you to connect your mp3 player via a cable but doesn’t have the bluetooth connectivity. You can see more about the JLL s300 treadmill here. 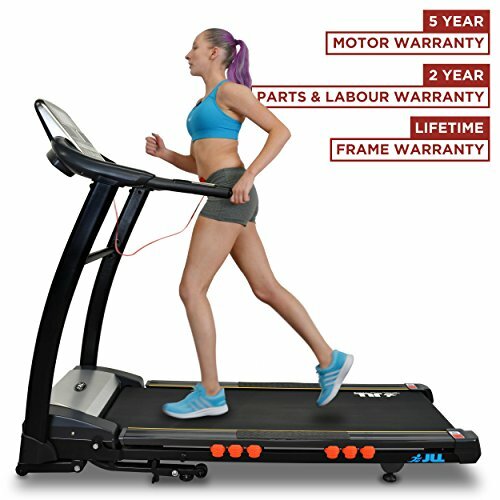 What do others think of the JLL S400 treadmill? Finding out what others think is a big part of an investment purchase like this one. I’ve been looking round to see whether there are any glaring downsides to this model and to get a feel for what other people are liking. The JLL s400 is actually a really well reviewed treadmill and rates really highly from everywhere I researched. It scores highly by being an extremely sturdy model which does the job really well. Some people feel that the price increase on this model in comparison to the s300 isn’t worth the money but overall I haven’t seen much that is negative about this. In conclusion I think that if you’re looking for a good, robust treadmill then you can’t go very wrong with this one. I personally like the extra room that this has and the Bluetooth connectivity is a winner with me.